Sophisticted and unique Eastern Cape safari accommodation in beautiful lodge suites and 2 bush villas can be found at Kwande Private Game Reserve in South Africa. 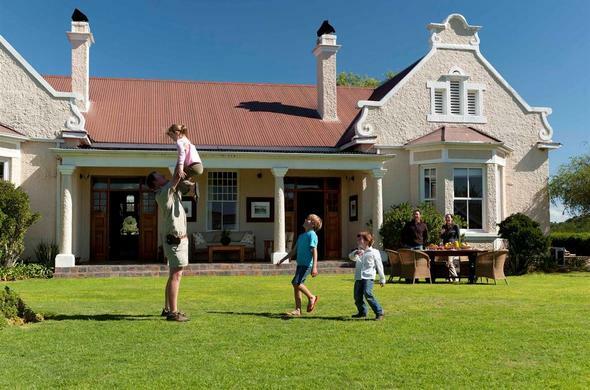 This Relais & Chateau safari accommodation offers luxurious suites at Great Fish River Lodge and Ecca Lodge, while Uplands Homestead and Melton Manor provide exclusive use villas for families or groups. 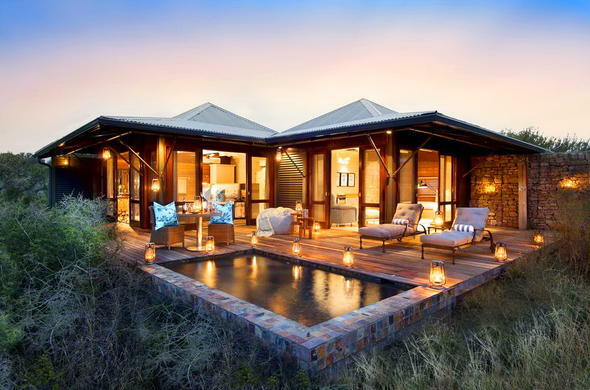 Each lodge and villa is appointed to the highest standard with luxury amenities including air-conditioning and internet access at Kwandwe Private Game Reserve. Great Fish River Lodge is set along the aloe studded banks of the Great Fish River, and offers a luxurious haven in the heart of the wild. Floor to ceiling glass doors lead onto private decks and offer a splendid vista from every corner of all 9 suites at this Kwandwe Private Game Reserve accommodation. Each stone and thatch suite features a private plunge pool with poolside butler service and caters for the needs of discerning travellers, with every luxury provided. The Main Lodge is uniquely decorated in a traditional Frontier Settler style, combining elements of the local African culture with antiques to create a place of beauty and warmth. Artistic mementos can be found in the Lodge curio shop. 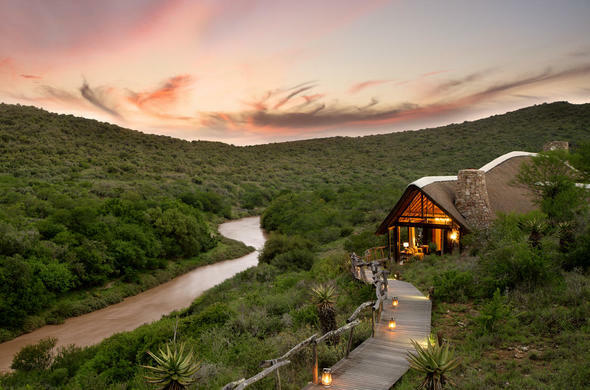 This superb Eastern Cape safari accommodation near Grahamstown, South Africa, is designed to blend with the environment. There are stunning guest areas with grand fireplaces, glass-fronted sitting and dining area, library, wine cellar and game viewing decks with wonderful river views. Delicious Pan-African cuisine can be enjoyed on the guest suite decks or in a number of atmospheric venues around the lodge, in the open-air boma and in the bush. Ecca Lodge offers stylish and intimate Eastern Cape safari accommodation in South Africa with thoroughly modern and trendy interiors. This safari lodge at Kwandwe is set in thick vegetation overlooking a dense valley with pagoda style roofs and internal wood panelling. There are just 6 exclusive suites with retro-chic décor, wraparound decks and individual plunge pools. Each suite has an ultra-modern bathroom with indoor glassed shower and outdoor safari styled shower. The main guest areas of Ecca Lodge include a spacious sitting room, dining room and bar area, a play centre for children, an interactive kitchen and a refreshing rim-flow lap pool. This elegant home from home offers gracious living in a beautifully restored 1905 farmhouse available for the sole use of guests. It consists of 3 spacious en suite bedrooms with private terraces. The interiors feature damask linen and antique silver, high ceilings with chandeliers, wooden floors and fireplaces. Uplands Homestead is located in a remote and tranquil valley with a full contingent of staff including a private chef and butler, game ranger, tracker and a private open 4x4 safari vehicle. The grounds consist of rolling lawns, a gazebo and swimming pool. This sole-use contemporary farmhouse is built in a U-shape to create a central courtyard with 4 spacious guest suites and deep verandas looking out at the surrounding hills. Luxury Melton Manor is a delightful retreat with warm and inviting interiors which combine the old with the new in a relaxed atmosphere. The Manor has a dedicated team of staff including a butler, chef, game ranger and tracker, as well as its own 4x4 safari vehicle. This Kwandwe Private Game Reserve accommodation has an interactive farm-style kitchen, library, an ox-wagon open-air boma and swimming pool. 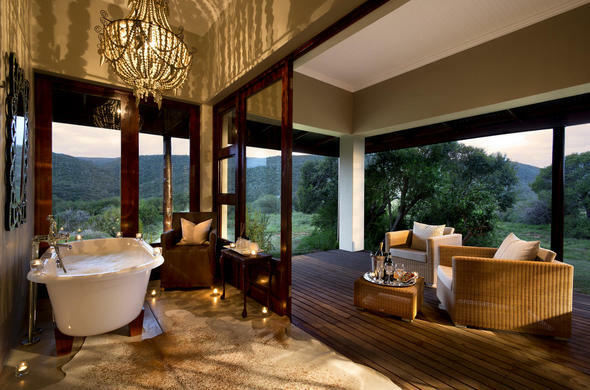 Guests at this Eastern Cape safari accommodation in South Africa can enjoy a romantic bubble bath in the free-standing bath tub with great views. 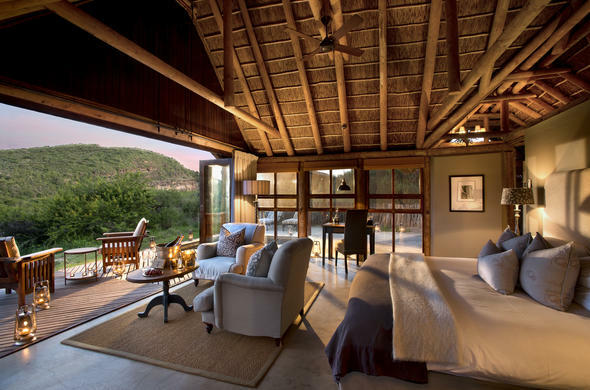 Guests at Kwandwe Game Reserve in South Africa can choose from various accommodation types. Stay at the Uplands Homestead, the Great Fish River Lodge or the Kwandwe Ecca Lodge. Families can enjoy the Melton Manor with wonderful garden.